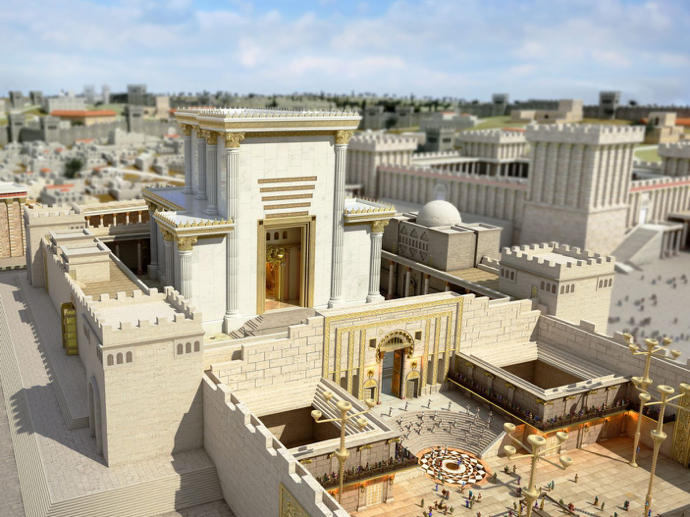 From the temple (our bodies) that we daily dwell in, to the ‘Temple’ that Jacob poured oil upon, to the Temple Solomon built, and on to the Second Temple where a twelve-year-old boy taught and astonished the rabbis with His incredible insight and wisdom; the Lord’s earthen dwelling places have served, and continue to serve, as physical reminders of His love and Holiness. Today, we are discovering numerous artifacts from the former Temples that served as earthen reminders of God—allowing for His creation to love and honor Him. These artifacts, relating to Holy places, be they from early Temples rediscovered under the City of Jerusalem, or pieces of the priestly articles from the Second Temple period, reflect the beautiful pattern of God’s love for His creation, and in turn, the love of the creation for God. 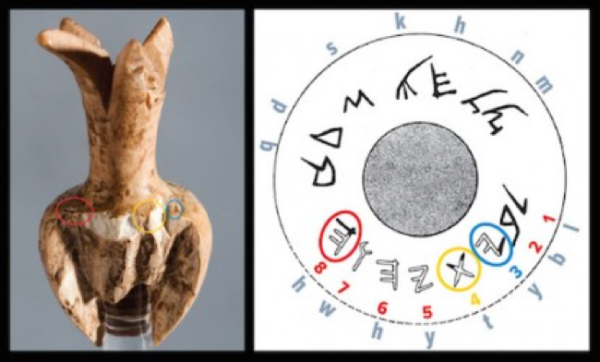 Yet, what can artifacts tell us that the ancient writings of the Torah and Bible cannot? Why is Jerusalem so important in all this? The answers display themselves for us, both through the ancient texts and through the artifacts that remain as a gift of God for our earthen selves—a strengthening of faith. When you read the Word, it is indeed living and active, but our conscious flesh-filled thoughts cannot always fully process it. We sometimes find that while our spirit man believes the Word and knows the physical truth of it… our flesh wants to see, to feel, to ‘know.’ It is through our weakness that God uses the remains of the past—artifacts—to strengthen our faith and draw us closer to Him. 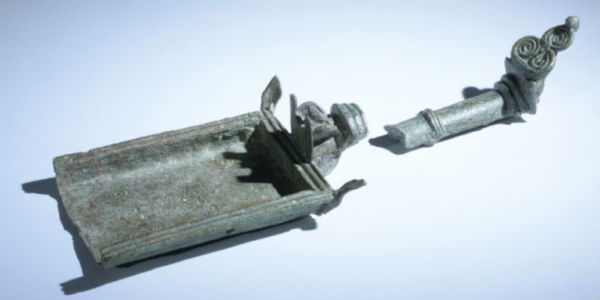 This incense shovel found in Magdala is therefore not only an important archaeological discovery, but also one of great spiritual significance. It shows not only the following of God’s commands and His creations love in following the commands, but, it also tells of God’s love for His creation… the blessing of Holiness. (Image Credit: Israel Antiquities Authority/Tazpit Press Service; Photo By: Clara Amit) Incense shovel for Jewish Temple use. Made of bronze. Cleaned. Indeed, many of the artifacts found do show us the blessing of Holiness. One such artifact, an inscribed stone that fell from the Southwest corner of the Temple Mount in Jerusalem, gives us a clear view of acts related to Holiness. In this instance, it is the sounding of the Holy day, a calling to the Sabbath rest, for the stone reads, “To the place of trumpeting.” The location of the stone in days gone by would have been near the corner of a parapet surrounding the Temple, where one of the Temple priests would have sounded a trumpet blast to call forth the Sabbath, and to announce its end—along with High Holy Days, such as the Feast of Trumpets (Rosh Hashanah). The ‘place of trumpeting’ was a place to declare the Holiness that God Himself ordained in His Word. It is a calling for the people to remember the Lord and to revel in His Holy presence. Holiness. The Holiness that God allowed mere flesh and blood beings to know was not only shown through the everyday acts in the Temple, such as the burning of incense, nor was it only written upon stone… no, it was carried and worn even by the Temple priests. The physical gift of God, the pomegranate, was used throughout the Temple in chainwork commissioned by King Solomon himself in the First Temple (2 Chronicles 3:16), and was also worn and used by the Temple priests. A scepter top in the shape of a pomegranate is one artifact that would have been not only used in the Temple, but is inscribed to indicate its relationship to the Temple, the priests, and through the mention of Holiness, its relationship to God. God’s gifts of the earth crafted not as idols, but to celebrate the Holiness of the Lord. 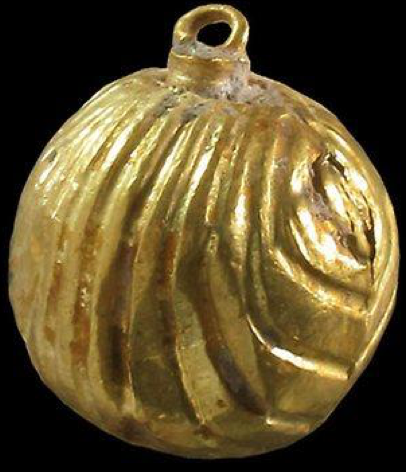 (Image Credit: Israel Antiquities Authority) Golden bell. Even the High Priests of the Temple wore bells of pure gold, almost daily, in amongst pomegranates of blue, purple, and scarlet on the hem of his garments. The Lord gave man gifts of the earth, which indeed were blessings beyond deserving; yet, He gave a much greater blessing—that of Holiness and a connection to Him. “You shall make the robe of the ephod all of blue. There shall be an opening for his head in the middle of it; it shall have a woven binding all around its opening, like the opening in a coat of mail, so that it does not tear. And upon its hem you shall make pomegranates of blue, purple, and scarlet, all around its hem, and bells of gold between them all around: a golden bell and a pomegranate, a golden bell and a pomegranate, upon the hem of the robe all around. And it shall be upon Aaron when he ministers, and its sound will be heard when he goes into the holy place before the Lord and when he comes out, that he may not die. Through all of these artifacts we see God’s love and His blessing of Holiness. The Word of God is shown in a unique way through these pieces of history, allowing us to better understand the scripture and the heritage of the land of Israel and Jerusalem. Certainly, through the Word of the Lord and the physical reminders He has blessed us with, the importance of the Word being brought forth into the present is clear. It is because of this knowledge that projects like the Kings Valley Seven Species Project are so very important. The Kings Valley project is specifically fulfilling Deuteronomy 8:7-8 and in the process is reminding the people of Israel not only of God’s Word, but of His Holiness, His Faithfulness, and His Never-Ending Love.